Airwheel electric scooters will integrate more thrilling functions besides transportation e.g. cross-country, communication and remote control, music player. Airwheel leads the trend and sets the standard in this section for its premium quality and supreme upgrade speed. Continuous innovation keeps a Hi-tech product thriving and robust. Innovation brings rapid upgrade as well as more advanced extensions. To be specific, Airwheel is driven by a state-of-the-art Mag-lev motor and powered by a Sony Li-ion battery pack, which features 1,800 rechargeable times, 2.9 times battery range and 3.8 times life expectancy of average Li-ion batteries on market. For customers, another major concern is quality and safety. 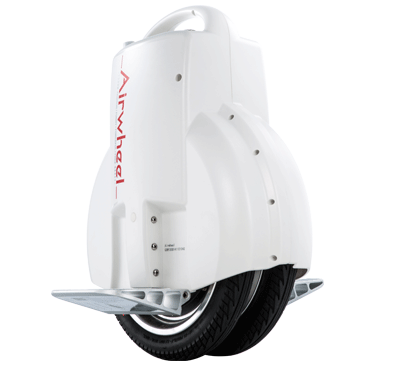 As the latest intelligent transporter, Airwheel electric scooter is the fruit of innovative spirit and hard work, as well as the optimization of core components and details. Powered by green and intoxicant-free lithium battery, Airwheel is eco-friendly and emission-free. In the recent years, electric unicycle have been prevailing worldwide as a new generation of transporter. Thanks to its profound background and deep understanding of self balancing unicycle, Airwheel optimizes production and sales in a short period as a startup. Nowadays Airwheel is an enterprise integrating R&D, production and sale, and is always one step ahead of other competitors. However Airwheel will not stop its pace, it has already set out for the next target- electric manned aircraft! Branded product features more humanized design and considerable details. Airwheel adults electric unicycle is highlighted by an exclusive auto-shutdown function when wheel’s idling.